midst of the Civil War. Nineteen-year-old Carrie Ann Bell is independent and spirited. The only thing she really fears are the Union soldiers fighting against her Confederate friends. When her youngest sister runs away from home, brave Carrie Ann is determined to find her and bring her back. Disguised as a soldier, she sets off---only to find she's fallen into the hands of the enemy. Her childhood friend Confederate Major Joshua Blevins has warned her against these Yankees: they're all devils, ready to inflict evil on unsuspecting young women. When Colonel Peyton Collier arrests her for her impersonation of an officer, it seems to confirm all her fears. Soon, though, she finds herself drawn to the handsome, gallant colonel. He rescued her, protected her, and has been every inch the gentleman. Carrie Ann discovers that her foe has become her ally---and more than that, someone she could love. But the arrival of Joshua in the Union camp as a spy will test her loyalties. Will she protect someone who has been like family or be loyal to this stranger to whom she wants to offer her heart? When her world is being torn apart around her, whom should she trust? 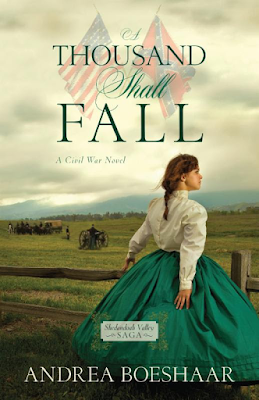 A Thousand Shall Fall was a bit of a slow book for me. The last third of the book picked up, and I was anxious to read to the end; however, it didn't feel like other books I've read of Andrea's. I wished the beginning had more depth or background to many of the characters and situations. I know it must be hard to write a book without having too much information. Too much can make the reading tedious. Nonetheless, I would have enjoyed a longer book with a bit more detail to Carrie Ann's younger years (the fire, her relationship with Joshua), and a little more background on Peyton. I liked Carrie Ann and Peyton, but I never really felt their initial attraction in the pages. Still, by the end, I liked the overall story and especially enjoyed the time Carrie Ann was at Aunt Ruth's house. Will I read book 2 (about Carrie Ann's sister, Margaret)? Probably. I hope a few things from book 1 will also be resolved. That's what I thought! Click HERE to see what other reviewers are saying! Thank you to Andrea and Kregel through Litfuse for sending me a copy to read and review! Did you find my review helpful? Please rate it on Amazon and Christianbook.